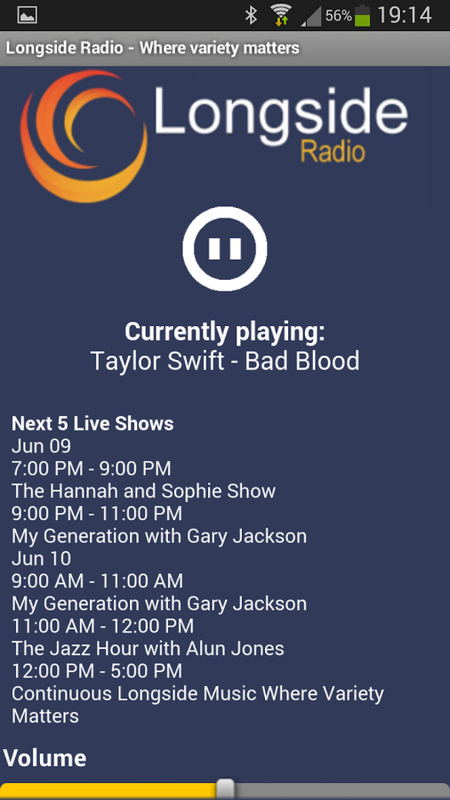 (Android) Longside Radio app v1.1 released! v1.1 of our Android app has gone live and your Android devices should be updating soon with the new version! It takes a while for updates to happen on the Google Play store but the update should be available in a couple of hours max. What’s new? Well it now starts playing the station as soon as you fire up the app now (but there is a checkbox so you can turn this off if it annoys you. It now displays the next 5 shows in the calendar and has a lovely button for loading the Longside Radio website (we are going to be having a push soon to make it work better on mobile devices as it could be better). ← Louie Louie AY YA YA YA YEAH! Longside Radio is a not-for-profit community radio station. We exist to provide experience for anyone to learn about radio broadcasting and to entertain our listeners. The Station costs a lot of money to run and we rely on fundraising and donations. Please click here to donate to the station. Thank you! Hello. Well as we celebrate Easter here in the UK, I do hope you'll join me for a special 'Easter Sunday' broadcast of 'The Jazz Hour' from 9.00pm on Sunday evening, here on Longside Radio. In this weeks' programme, alongside a number of Easter titled tracks, I'm recognising the birthdays of Gene Ammons, Shorty Rogers, Herbie Mann and Lionel Hampton. I've got a couple of requests to get through and I'll another offering from the April 'Album of the Month', featuring the super Manchester based 'The Ollie West Band'. Well I do hope that's tempted you to join me on Sunday evening. Have a great weekend and enjoy the chocolate!! Hello..Following on from Tony St John and his 'Vintage Vinyl Record Show' on Longside Radio, from 9.00pm I'll have your week 'jazz fix' live from Studio One. In this weeks' programme I'll be taking a mini showcase profile look at saxophonist and British born big band leader Ken Mackintosh, an almost weekly favourite on BBC radio in the 50s and 60s. Amongst the 'birthdays' from the past seven days I'll have tracks from a trio of 'legends'..Billie Holiday, Carmen Macrae and Helen Forest and in the theme 'Jazz at the Movies', I'll have the opening track from the 1980 TV series 'Mike Hammer'. The Manchester based 'Ollie West Band' will be releasing their debut album on the 19th April, this coming Friday, and it's an album entitled 'Time Stood Still' which is 'Album of the Month' for April on the programme and it really is very good. Well with much more 'thrown in', I do hope you'll join me from 9.00pm on Sunday evening here on Longside Radio for some great jazz!! Hello. 'Time Stood Still' from the Manchester based 'The Ollie West Band' is the title of a new 'Album of the Month' starting on Sunday evening, on 'The Jazz Hour' here on Longside Radio...and it really is very good. 'Birthdaywise' from the past seven days, I've got tracks from pianist Duke Jordan, 'The Godfather of Fusion', guitarist Larry Coryell and saxophonists Stan Turrentine and Gerry Mulligan. In the theme 'Jazz at the Movies', the 'National Youth Jazz Orchestra' entertain us, with a track from the 1988 movie 'Who Framed Roger Rabbit'. Well thats all to come plus much, much more including a track from the Scottish based guitarist Steve Garrett from an album that he released only on Friday. So I do hope that's tempted you to switch off the tele and tune into Longside Radio on Sunday evening from 9pm from some great jazz!! Have a great weekend and as always..look after yourselves out there!! Longside Radio - Where Variety Matters is at Longside Radio - Where Variety Matters. Live now for our Sunday morning songs of praise show. Hello. On 'The Jazz Hour' for this week, I'll be taking a mini-showcase profile look at the RAF Swing Band 'The Squadronaires', who did so much to entertain the troops both here in the UK and Europe during the Second World War. It was Wednesday evening last, that I journeyed to the 'Pershore Jazz Club' here in Worcestershire where a packed audience were entertained by a quintet led by Alex Clarke..remember Alex?..yes it was her debut album entitled 'Mirage' that was 'Album of the Month' for January and this hugely talented saxophonist really 'belted out' the numbers on Wednesday. Well I'll be telling you all about the evening and I'll be playing one of my favourite tracks from her superb album. Talking of 'Album of the Month', I'll have the 'final instalment from the March offering...an album entitled 'Jazz City UK Volume 2: The Jam Sessions' which features many of the great and the good of UK musicians. Amongst the birthdays', I'll have tracks from singer Sarah Vaughan, saxophonist Ben Webster and multi-instrumentalist Pee Wee Russell, all three of whom were welcomed into the world on the 27th March and in the theme 'Jazz at the Movies' I'll have a track from the 1960 crime thriller 'Murder Inc'. Well, with a bit more thrown in, that should just about get me through the hour till 10 o'clock, so set your alarms for 9.00pm on Sunday evening, here on Longside Radio, where I can promise you some great jazz. Copyright © 2016 Longside Radio. All rights reserved.